Obituary – Kime, Wesley Joe « Perry High School Alumni Association, Inc.
﻿Wesley J. Kime, 30, of Oklahoma City, formerly of the local area, died about 8:15 p.m. Sunday in a tractor accident on a farm seven miles, east, three and three-quarters south and a quarter west of Perry. Funeral services for Kime will be at 2 p.m. Wednesday in the First Christian church. Rev. James Lambert, pastor of the church, will officiate and burial will be in Grace Hill cemetery under direction of the Newton funeral home. Kime was born Nov. 5, 1938, in Perry. 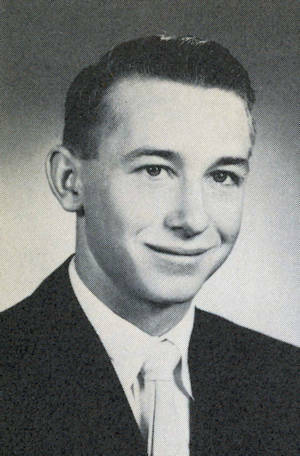 He graduated from Perry high school in 1956 and attended Oklahoma State university. He has been employed by Putnam Jones Lumber company in Oklahoma City the past five years. Survivors include his parents, Mr. and Mrs. Fred Kime of Perry; one daughter, Rebecca Jo Kime, and one son, Craig Wesley Kime, both of Oklahoma City, and his grandmother, Mrs. Lillie Kime, Perry.